The Japan! Japan! Blog: Bento! #129: Shouka Fuumi no Yasai Raamen..
Bento! 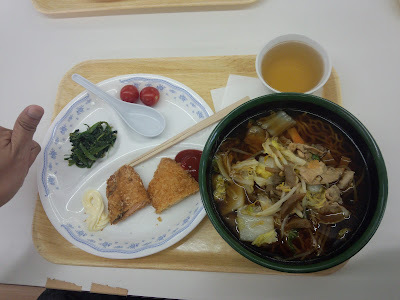 #129: Shouka Fuumi no Yasai Raamen..
生姜風味の野菜ラーメン, 420 yen from the school cafeteria, shown on right. Photo taken by my friend, Okada-san, using his brand new Fujitsu Android smartphone! Literally translates to "ramen with vegetables in ginger-flavored soy sauce-based soup." It's not bad. In fact, I like it because it has a lot of meat as well as veggies in it, which I didn't expect. So in addition, I got me 198 yen of some fried salmon cutlet, chicken fillet cutlet, some spinach and a couple of cherry tomatoes from the "buffet" bar.